The Patrick Henry Green Street was the first to be installed in Arlington. The two rain gardens in the median are a component of a Neighborhood Conservation Program project. They capture runoff from three quarters of an acre. 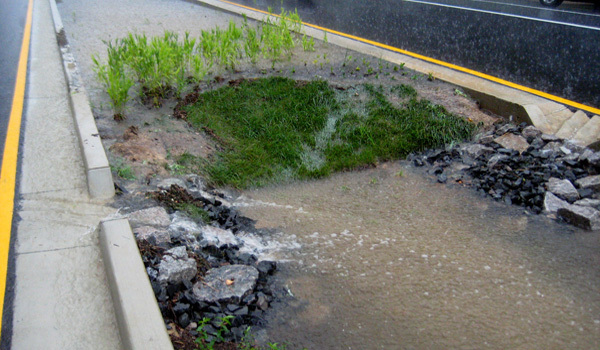 During a rain storm, water enters the rain garden through the curb cuts. The rain water flowing into the rain garden will soak through the garden’s soil and gravel layers, then slowly soak into the ground. The North Albemarle Street rain garden also receives stormwater runoff from three quarters of an acre. Two green streets were installed in the median of Williamsburg Boulevard and they manage stormwater from over 2 acres of paved surfaces. A green street is a street with a vegetated area in the public right of way that reduces the volume of stormwater and stormwater pollutants that enter our local streams, Potomac River and the Chesapeake Bay. They are one of the best tools we have at our disposal to address environmental and regulatory stormwater needs. We recently worked with the Center for Watershed Protection to study all County watersheds and identify appropriate spaces on County land where green street projects can be added. The vegetated green street areas may be located between the sidewalk and the curb or in a street median. The locations for green streets are determined by where the stormwater flows and the existing configuration of the street. This diagram shows a cross section of a typical green street rain garden in the street median. The rain garden has a small ponding area for runoff, underlain by several feet of soil and gravel. There's an underdrain at the bottom to allow water to flow to the storm sewer system after it's filtered. The bowl-shaped, vegetated areas in a green street are rain gardens. They provide a temporary place for water to collect, be filtered by the soil and plants, and soak into the ground or be released into the stormwater system. An underground pipe, or underdrain, is incorporated into their design, connecting the rain garden with the stormwater system. The pipe ensures that the rain garden will drain in less than 48 hours to prevent mosquito breeding. The underdrain allows water in the rain garden to exit to the storm sewer system if underlying soils drain slowly. The rain garden is maintained by the County quarterly, including visits to weed, prune, clean out sediment and litter, replace plants when necessary, and to make sure underdrains and overflows function correctly. We welcome help from neighbors to keep the facilities free of litter and leaves. Native plants are selected that can tolerate both wet and dry conditions. 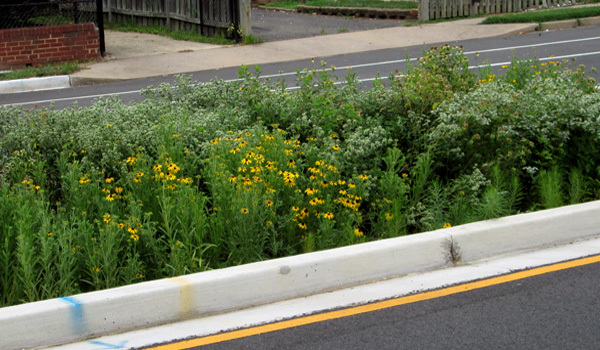 We select native plants that grow no more than 2.5 feet above the curb. 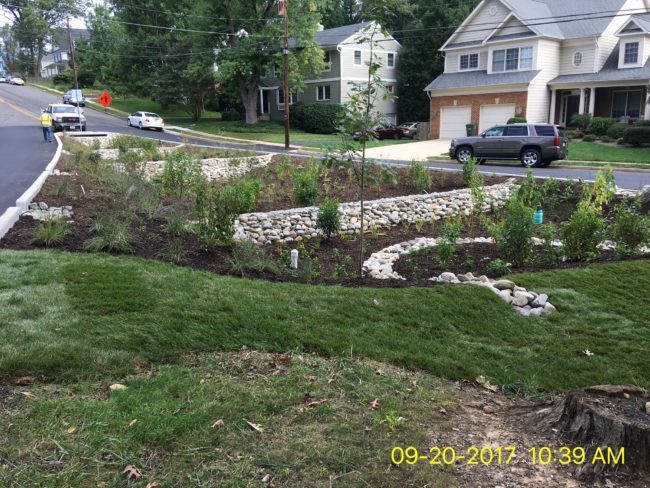 Green street projects are often implemented in partnership with other County programs such as the Neighborhood Conservation Program, the Stormwater Management Program and the Complete Streets Program. Will a green street near our house cause water to seep into my basement? No. The distance from most homes to the street, along with the depth and design of the rain gardens, will ensure that basement seepage won't occur as a result of a green street. Is the green street rain garden a safety hazard for children in the neighborhood? The rain gardens are designed to contain no more than 6-12 inches of ponded water. Additional water will overflow to a stormwater inlet. The special soil installed in the rain garden ensures that the water will quickly infiltrate into the soil. The rain garden will only hold water for a few hours following a storm. Does a green street rain garden concentrate pollutants in the soil? Pollutants captured in the rain garden bind to soils or are taken up by the plants. The plant roots and soil organisms also help break many stormwater pollutants. We'll regularly monitor the rain gardens. 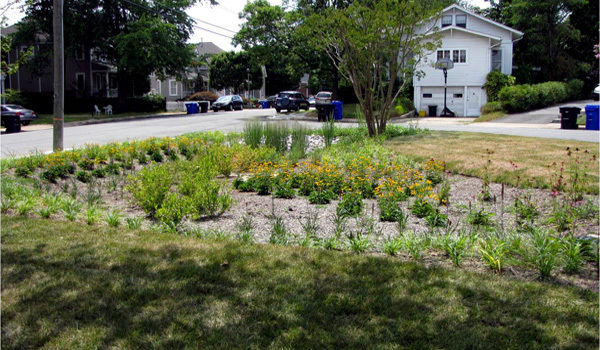 When necessary, the rain garden soils will be replaced to ensure proper filtration. Other cities using green streets, such as Portland, OR, have analyzed soils from green street gardens and haven't found any evidence of pollutants accumulating in concentrations that pose a health risk. Will the green street project remove parking spaces? If a green street rain garden is located in the median, parking spaces won't be removed. If the rain garden is installed at the curb, it will likely displace several parking spaces and in some cases may eliminate parking across the street. Where possible, we try to maintain on-street parking.